Promises made to Collins for tax bill support are slipping. That’s reason for concern. Sen. Susan Collins, R-Maine, smiles as she walks to the Senate floor to speak as Republicans in the House and Senate plan to pass the sweeping $1.5 trillion GOP tax bill on party-line votes, at the Capitol in Washington, Dec. 18, 2017. President Donald Trump hasn’t even signed a Republican tax cut bill into law and the promises Sen. Susan Collins said she received to gain her support for the bill have begun to unravel. In exchange for her support for the GOP tax bill, which weakened the Affordable Care Act by repealing the mandate that individuals buy insurance or pay a penalty, Collins said she received assurances from Senate Majority Leader Mitch McConnell that two health care proposals, which could lessen the impact of the mandate repeal, would be passed before the end of the year. On Wednesday, Collins and Sen. Lamar Alexander, a co-sponsor of one of the provisions, said there would be no vote before the end of 2017. With the timeline already slipping, we fear other aspects of McConnell’s pledges will falter as well. “It looks like the Christmas present of lower health insurance premiums will now have to be a Valentine’s Day present,” Alexander said blithely in a statement. This isn’t a lighthearted matter. The repeal of the individual mandate will leave 13 million Americans without health insurance and raise insurance premiums by 10 percent, according to the Congressional Budget Office. But, he said, tax bill supporters wanted to keep that quiet because people might not like it. We’d like to share Collins’ confidence that these measure soon will be passed by Congress, but we remain skeptical. It is hard to foresee Republican lawmakers supporting provisions to revive the Affordable Care Act when they believe it is close to being killed, especially in an election year. Republican congressional leaders tried repeatedly to repeal the Affordable Care Act over the summer. Collins was one of three Republican senators who blocked the repeal; all three were hailed as heroes. Yet, just months later, all three supported the GOP tax bill that severely weakened the health care law. This turnaround is hard to accept, especially when the same rushed and secretive process — which the senators condemned about the Affordable Care Act repeal bills — was used to craft the tax bill. And, no matter the timetable, some House Republicans have made it clear they would not support the Collins-backed provisions or that it be paired with provisions making it harder for women to obtain abortions. 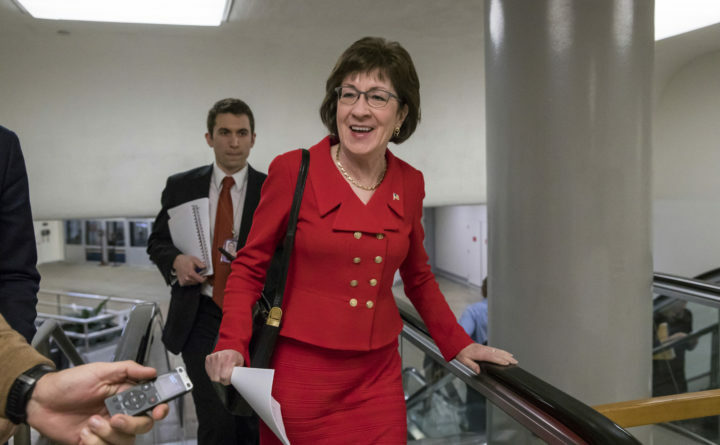 Collins wanted support of provisions to restart federal payments to health insurers that reduce the cost of insurance premiums for low-income families and to create high-risk pools to continue coverage for those with pre-existing conditions. The provisions are aimed at reducing the impact of repealing the individual mandate. Analyses of the provisions reached differing conclusions. A recent analysis by Oliver Wyman Health found that the provisions, which would allocate $5 billion a year in 2019 and 2020 to states to help them stabilize the individual health insurance market and would continue payments to reduce insurance premiums, would reduce premiums and bring additional people into the market. Other analyses conclude that Collins’ provisions would lessen, but not eliminate, the impact of the mandate’s repeal. Collins initially hoped for a vote on the provisions before voting on the tax bill. Instead, she accepted assurances from McConnell that he would bring the measures up for a vote before the end of the year and that he would support their passage. With this promise already evaporating, we fear that Collins’ work to shore up a weakened Affordable Care Act will continue to be met with resistance and delays.